As ICTJ looks back on its 15 years of work, join us in celebrating our allies across the globe who struggle for human rights, against impunity. To honor their efforts in the trenches of this struggle, we will bring you their stories in the weeks and months to come. This is the story of Mark Thompson, CEO of Relatives for Justice, a group struggling for truth and justice in Northern Ireland. On February 12th, 1989, sledgehammers smashed through Pat Finucane’s front door in north Belfast. Paramilitaries stormed his family home and found the 39-year-old human rights lawyer eating Sunday dinner with his wife and three children. They shot him 14 times and fled. Nearly 30 years after Finucane’s killing, questions persist. Who commissioned the murder? Was the British government involved in some capacity? And when will justice for victims finally be served? These are the questions Mark Thompson grapples with every day. Thompson is one of the co-founders and CEO of Relatives for Justice (RfJ), a Belfast-based organization that demands truth, accountability and reparations for violence perpetrated during the Irish conflict. It supports families both emotionally and legally in their struggle for justice. Thompson knows this struggle all too well. In 1990 his brother, Peter, was killed by the British army as part of a shoot-to-kill operation. Police never properly investigated the murder, and Thompson’s efforts to spark a thorough inquiry were met with ridicule. Shattered by the loss and stonewalled by the legal system, his family was desperate for recourse. Some, including his cousin, joined armed Irish republicans and was later killed. Thompson, though, took a different route: he knew about Finucane’s death and contacted the murdered activist’s family and longtime legal partner, Peter Madden. In 1991 Madden, Thompson, and the Finucanes joined with a number of other victims and allies in founding RfJ as a way to support families in the search for answers and redress. Addressing the past in Northern Ireland means coming to terms with the 30-year conflict beginning in 1968 between the mostly Protestant unionist side, which sought to remain loyal to the British Crown, and the predominately Catholic republicans, who advocated for an independent Ireland. The region had been under British control for over 400 years, and as the conflict grew increasingly violent, the British government deployed the army, leading to mounting tensions: at the height of the conflict there were 27,000 military personnel and 13,000 police officers patrolling a population of just 1.5 million. In addition to the official state presence, paramilitary organizations – like the one that killed Finucane – worked in conjunction with government personnel to harass, intimidate and often times kill republicans. At the same time, the armed group Irish Republican Army (IRA) claimed hundreds of lives on the unionists’ side. The conflict resulted in deaths of some 3,600 people during this time. The violence committed in Northern Ireland against republicans was often not investigated by the British-controlled police or judiciary. Victims’ families received superficial inquiries and faced scorn from officers. Thompson was raised at the crossroads of this conflict: born to a Catholic mother and a Protestant father, and with relatives in the IRA, he and his family was a frequent target of unionist violence. These early brushes with the sectarian violence pushed Thompson towards activism, but his brother’s murder affirmed his commitment to the struggle for justice. He saw firsthand the extent of impunity in the country, and the ability of the British government to suppress the truth. “We don’t separate the healing and recovery program of trauma from the issue of justice...Trauma can only really be addressed and understood in the context of accountable justice." The answer, according to RfJ, is a multi-pronged approach that holistically addresses victims’ emotional needs and their legal right to justice. Its twelve full-time staff members work alongside victims to advocate for an independent truth recovery mechanism which would investigate crimes committed by both sides of the conflict, and to coordinate legal efforts meant to end impunity and expose the truth. But this work is built on a platform of community-based support for victims. RfJ recognizes that unearthing the truth has costs: victims face resistance in trying to uncover the truth, and they are asked to speak publicly time and again about the most painful moments of their lives. Moreover, if the truth is to be uncovered, that too can prove traumatic to some victims. That’s why RfJ operates a parallel program to its truth and accountability efforts. The program employs between 20-30 mental health workers who operate from around a dozen trauma centers it has established across the country. Its program is modeled after Judith Herman’s work with Holocaust survivors, which linked treatment for violent trauma to the need for justice and accountability. The program treats stress, anxiety, depression, addiction, alcoholism, and other manifestations of trauma common in Irish communities, using everything from traditional talking therapies, complementary therapies to social treatments like art therapy, social support and activities. In the last calendar year, 3,400 victims received some sort of support from RfJ. In providing this grassroots emotional and psychological support for victims, RfJ lays the foundation for its legal advocacy and human rights struggle as well. The two are intimately connected. Take, for instance, delays in official inquiries. Thompson says that when people were killed in controversial circumstances, with police and military officers potentially implicated, officials intentionally delayed inquests, dragging their feet as a way to circumvent justice. RfJ partners with families to pursue legal cases designed to hold the UK government accountable under European human rights law. The country’s peace agreements are structured around European convention rights, Thompson says, so while domestic courts may offer limited pathways to justice, RfJ – at times working in consultation with ICTJ – has found some success in achieving justice by enforcing international covenants. One such instance was in 2001, when RfJ supported families and lawyers in submitting four cases of outstanding murder investigations to the European Court of Human Rights (ECHR) in Strasbourg, France. In these cases, RfJ argued that the British government was in violation of Article 2 of the European Convention on the Right to Life, which obligates signatories to promptly, thoroughly and independently investigate the circumstances when anyone is killed. The court found unanimously that the UK government was in violation of the article, which forced the state to revise its investigations. This ruling’s implications reverberate today: The Committee of Ministers to the Council of Europe recently elected to continue monitoring the UK government’s approach to these investigations, and RfJ submits reports to the Committee in order to maintain pressure on the UK investigators. The organization believes this international approach is instrumental as the UK government grows increasingly isolationist in its approach to dealing with the past. RfJ also works to ensure the objectivity and effectiveness of domestic efforts to uncover the truth, with work focusing on the Police Service of Northern Ireland (PSNI), which was established by the Good Friday Peace Agreement in 1998. The PSNI previously established a Historical Enquiries Team (HET), which promised to investigate and disclose information about violations committed during the conflict. However, RfJ says the unit lacked objectivity as primarily retired police officers and soldiers staffed it. In fact, Mark says, some members of the unit had even approached RfJ to leak that the unit was burying some of its findings. Following those revelations, RfJ supported families in legally challenging the HET. The unit was eventually disbanded, following a report into its investigations and accusations of bias. RfJ has been at the fore in arguing that only an independent investigative process free from interference from all sides to the conflict can succeed. 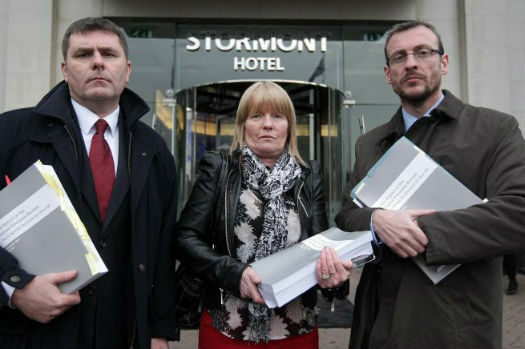 The 2014 Stormont House Agreement between the British government, the Irish government and Irish political parties provided for such a mechanism, but its implementation remains in limbo following the British government’s insertion of a “national security” veto. Such a veto would override the disclosure of some information, which has led to outcries from Irish republican organizations. These isolated, episodic legal maneuvers are not a panacea – justice is still pending for the vast majority of victims in Northern Ireland. However, they do serve an important role in establishing historical truth about the crimes committed during the Irish conflict and the legacy of British colonialism more broadly. “The British government will eventually extract themselves from Ireland with the least amount of damage to their reputation leaving unionists carrying the can. This is the legacy of colonial imperialism everywhere the British went,” Thompson says. By mounting legal challenges to this rush to absolution, this rush to amnesia, RfJ hopes to force all parties – unionist and republican – to confront the truth about the conflict once and for all. These efforts can have repercussions well beyond Northern Ireland, and Thompson is eager to connect RfJ’s struggle to similar struggles across the globe. Take the case of Belfast's Francis Rowntree: Rowntree was 12 in April 1972 British soldiers shot him with a rubber bullet. Rowntree died, and his family – and RfJ – insists was not sufficiently investigated. Questions remain about whether the bullet that killed Rowntree had been doctored to inflict more damage on its victim. RfJ worked with the Rowntree family to pursue a fresh investigation, which was ordered last year. However, as it was working on Rowntree’s case, RfJ learned about a similar killing in South Africa. Christopher Truter was just 15 when state forces killed him in 1976 while protesting the apartheid regime. Like Rowntree, he had been killed as a minor by a weapon meant for non-lethal crowd control. Decades later, his grave only had a makeshift marker. Thompson was moved by Truter’s story, as were other families in Belfast who had lost loved ones in similar situations. So the organization held an event in Belfast among families who lost children at the hands of British soldiers, and raised money for a headstone for the Truter family. “It was an act of international solidarity between two children on two different continents, living in areas subject to economic discrimination, a form of apartheid, violence, militarization, conflict and struggle,” Thompson said. A hierarchy of victimhood persists in Ireland, and the shadow of an unexamined past continues to loom over the country. Thompson, for one, is eager to shed light upon it, but his work is not without peril. He’s twice had to move after a known paramilitary was discovered with Thompson’s home and work address in his pocket, along with 9mm ammunition. But Thompson is undeterred. RfJ continues its fight, and the need for their services is as clear as ever. Just last month, a legal challenge by Pat Finucane’s widow against the failure of the UK government to hold an inquiry into his murder was unsuccessful. The family claims that the British government’s decision reneges on a 16-year old pledge to finally complete the investigation. The court ruled that the government had a right to change its mind despite an agreement between the Irish and UK governments to hold several inquiries. The wheels of justice grind slowly indeed. While the decision is a bitter blow to the Finucane family’s efforts, they are resolved to carry on and will likely appeal to the UK’s Supreme Court. RfJ will remain by their side – as, since 1991, they have stood by all the victims of the conflict. Thompson, for one, is optimistic. PHOTO: Mark Thompson,left, alongside Teresa Slane, widow of Gerard Slane killed by same loyalist gang that killed Pat Finucane, and lawyer Paul Pierce on receiving copy of De Silva Review into Finucane's murder (RfJ).